// Between the lines //: Fun with... pizza dough! Both girls had a friend over for a sleep over (sisters too!). They had a lot of fun together, and though I know that at this age they can play together really well without 'help' of a grown up, I did foresee a couple of activities to do together. One of them was baking. M. had a pizza atelier a little while ago with her friends for her birthday and there they made 'viennoises au chocolate' with left over dough. A great idea, if you ask me. This reminded me of a recipe I read somewhere (I can't remember where, unfortunately) for cinnamon bread sticks made from pizza dough. Instead of bread sticks, we decided to make cinnamon rolls and to give the chocolate viennoise a try as well. We had no idea how both of these would turn out but it was worth a try, we figured. We split up in two teams and made two delicious snacks in no time! Keep on reading if you want to give this a try. As you'll notice it's all very intuitive - you can't go wrong really. For the cinnamon rolls you'll need one package of pizza dough - ours was not frozen and already rolled out which made it even simpler. If yours is frozen, let thaw and then roll out the dough with a rolling pin, the way you would for a pizza. With a brush spread melted butter over the entire surface of the dough, next sprinkle the entire surface with sugar and cinnamon. Roll the dough now to obtain a log. Cut the log into 1-1 1/2 inch pieces. Place each one of them in a muffin pan lined with cup cake liners (unfortunately, I just had the girls grease the pan - I'm soaking the sticky pan with baking soda now, in an attempt to get the melted sugar off... I added the liners for the picture and to hide what's missing... LOL). Bake in a 350°F oven for about 20-25 min or until golden and the sugar bubbling. Let cool on a wire rack. Easy!! 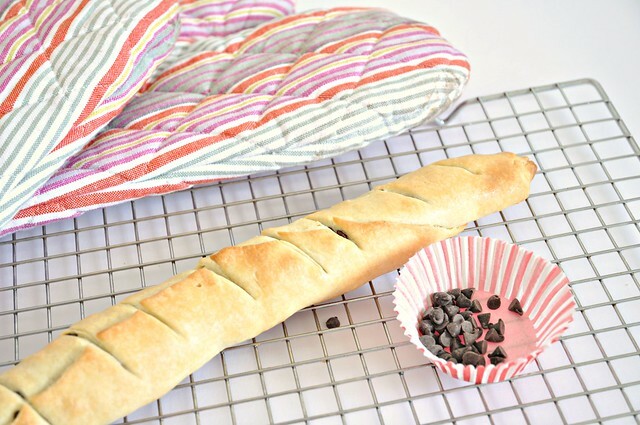 Even more easy are the pizza dough viennoise au chocolat. Same here, roll out your dough, as you would when making pizza. Sprinkle some chocolate chips in a line at one end of the circle, next roll the dough such that the chocolate chips disappear inside, sprinkle some more chocolate along the fold, roll, sprinkle, roll,... and continue like this until you've obtained a log. With a sharp knife make some cuts on top. Brush the top with melted butter and bake in a 350°F oven for about 20 minutes or until golden. Let cool on a wire rack. Bon appétit! 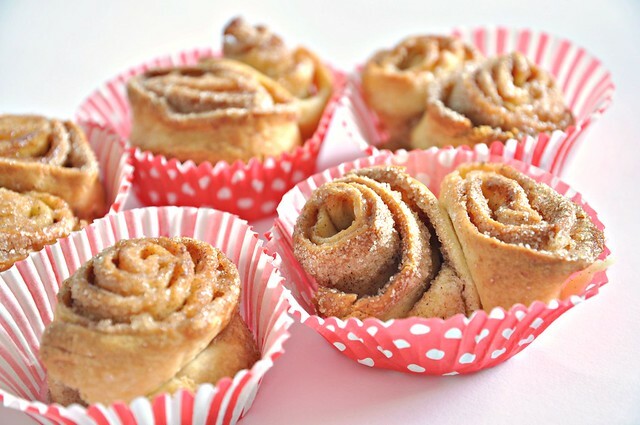 Note: Our cinnamon rolls were really crispy (and SO yummy!) because the dough was rolled out really thin - if you like them moist and soft, use more butter and roll out the dough less. Adjust the baking time if necessary.